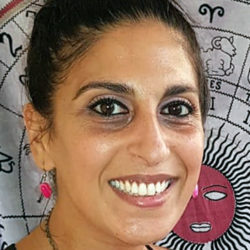 Hi I’m Anthi, and I am a Spiritual, Intuitive Psychic Reader. Through my own experiences I counsel and guide people back to their truest form, unconditional love. This line of work isn’t just to offer guidance through readings, but to also aid others to dig deep and clear out blockages that have prevented them from receiving what is for their highest good. I have many clients globally who come to me for spiritual guidance as well as readings. It is so rewarding when they tell me how their life has changed for the better, and how my readings have helped them. It isn’t a service from me, but a blessing from the Divine Source which is available for absolutely everyone in the world. I have had this psychic ability ever since I can remember, reading for my parents at the age of 8 through the Greek coffee cup. 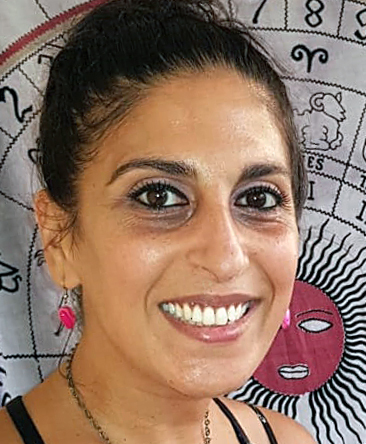 My mother is also a psychic medium and we have a blood line of psychics in our family, so it’s certainly been passed down through the generations. Whilst I had other life plans to focus on my creative career, the Universe certainly had other plans for me! Over 10 years ago, I realised my purpose and mission was to do this spiritual work professionally, helping and aiding all people through their journeys of life, and to bring them back to unconditional love. My life has never been so fulfilled and content until I started living my soul mission. I am so truly grateful for being able to help and be of service. I look forward to meeting you and to give my all to you. As a Light-worker, Twin Flame and Empath, I sincerely understand those around me, and what I’m here to do for you. Feel free to watch my Video Interview explaining my psychic abilities. A voice message from Psychic Anthi to you. Click Play below! Anthi is rated 6.0/6 from a total of 26 Rated Reviews. Love this woman! Anthi, you frame everything so effortlessly that the understanding just follows. You are a living, breathing example of compassion and wisdom combined with divine guidance. With gratitude. A Big Thankyou to Anthi. You provide tremendous insight in such an inspiring way. Even unveiling that which I was not aware of, but which assisted with some unanswered questions. Truly, a testament to your gifts. With much appreciation. Just had the most amazing reading with Anthi... consistent and genuine. Can’t wait to tell you how I’m feeling at its fruition! Very kind, honest and accurate. Thankyou for your help. My first reading with Anthi and wow, everything she said I knew exactly what she was talking about. The very next day something she said would happen did. I’ll definitely be calling again. Thank you so much Dani and it was an absolute pleasure to read for you. I hope you let me know when things start to happen and I'm here anytime you need me. Lots of love to you sweetheart. Thank you Anthi for a great reading last night. First time I have spoken to you and I thought wow! I did not have to say anything, you picked up on my situation straight away and you were honest, accurate and lovely. I highly recommend Anthi, she is a great reader! Anthi, thank you so much for the reading. So accurate and so many validations. Always uplifting and honest. Thank you for sharing your guidance with me. Lovely first reading with Anthi, yet to see how things turn out but was really easy to talk to & enjoyed the reading. Wow Anthi you are so good, I’m blown away how accurate your reading was. You picked up that the job I applied for was not the one, but a better job was coming and there was fast energy around it. Sure enough I found the job 4 days later and started the following week. And it’s the perfect job for me. A big thank you. You’re a great reader. 6 stars from me. Many thanks Anthi - you validated so clearly, and in such an orderly fashion, the info I have been receiving from another line. I was looking for the validations and you certainly provided them. Many thanks. I'm excited!! Such a beautiful soul, thank you. Your voice is calming and very reassuring. Your reading was accurate, and you picked up on the current situation. I look forward to your predictions. Stay beautiful. Another great reading. Thank you Anthi, for your kindness, wisdom and guidance. Look forward to speaking to you again! Anthi is very lovely and caring. So accurate with my reading and a couple of surprises in there too! Thank you so much, you've given me a lot of hope and I look forward to the changes. Thanks Anthi. Great accurate reading. What a great pleasure it was speaking with you. Your reading was so uplifting and was so spot on. You delivered my reading with such warmth and understanding which I thank you for. I will definitely be calling you again. Thankyou Anthi. Thank you so much for the amazing reading. Incredibly accurate and lovely to talk to. Wow!! Thank you for your honesty and understanding with my situation, all those tough times seem a little easier when you explain the reasons behind them. I have never given up nor will I ever give up!! I really appreciate your kind words, it has helped me immensely and guided me in the right direction. You’re a beautiful lady, will definitely talk again. Thank you and love and light to you.